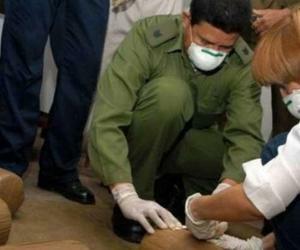 The Interior Ministry has blamed criminal groups made up of foreigners and Cuban émigrés to try to introduce drugs into the country, Granma newspaper reported. Last year the Government of Cuba seized 2,438 kg of banned substances, of which 77% was due to recalls captured on the coasts. According to the agency's annual report, the authorities faced operations organized by Cubans living abroad who used speedboats to transport them on routes near the country. In this regard, they reported that two attempts to introduce narcotics using this route were frustrated, actions that ended with four detainees and 144 kg of marijuana seized. Two operations in territorial waters were also halted, two foreign traffickers were arrested and another 132 kg of marijuana were seized. Through the air channel, 49 operations were neutralized, with a balance of 90 arrested (54 Cubans and 36 foreigners) and 81 kg of occupied drugs. According to the information provided, most of the events were organized and financed abroad by Cuban emigrants, for which they used emails of various nationalities and origin in several countries, as well as Internet tools such as Imo and WhatsApp. The 2,438 kg of confiscated drugs represent the smallest amount of the last three years, and are distributed in 2,071 kg of marijuana, 363 of cocaine, three of cannabinoids, one of crack and 0,15 of hashish. However, MININT insists that this does not mean that regional or internal risk has decreased.